We started hiking from the Saint Vrain Mountain Trailhead at 9:23. For a morning in early November it was quite warm, and we did some sweating before getting to the Saint Vrain Mountain/Meadow Mountain saddle. But nearing the saddle, the wind picked up, and we had to put a couple sweatshirts on. 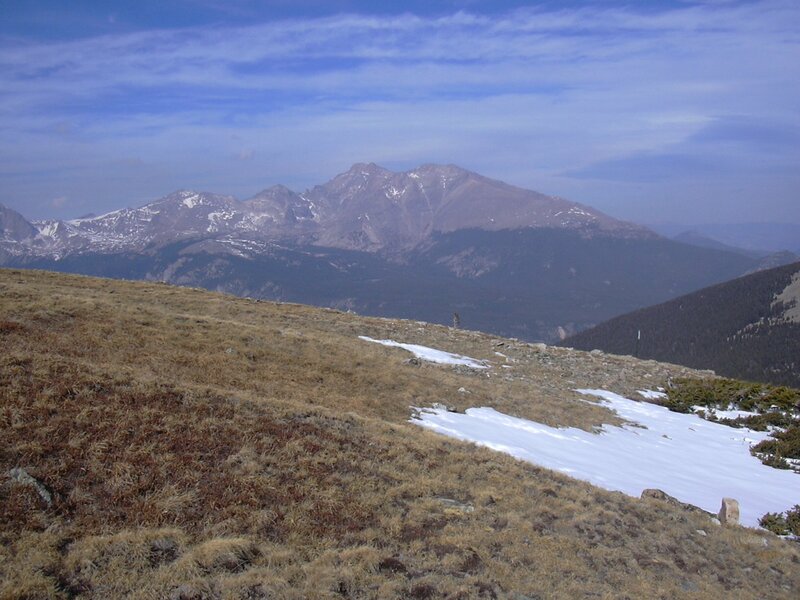 At the saddle, the wind was fierce, and we hiked rapidly against the wind toward St Vrain Mountain. Ascending the mountain, there were only a few inches of snow in spots. As we got to about treeline, we could smell forest fire smoke, and the view of all the surrounding mountains was hazy. I found out later on the web that the closest forest fire at the time was directly west of us, near the California/Nevada border! We reached the summit at 11:29. On the summit, the small rock wind shelter was filled with a snow drift. Digging out the snow from the shelter seemed more trouble than it was worth, and after only about a minute, the wind and cold, convinced us to begin our descent. It was so cold, we didn't bother to take any pictures, but we did take a few halfway down the mountain where it wasn't quite as windy. On the return, we stopped for lunch at a sunny spot below treeline. We returned to our parking place at 13:49. It took us 2 hours and 6 minutes to get to the summit from the parking place. The elevation change was 3,208 feet. I love this hike because it's intense exercise with great views at the top, although it's usually quite windy on the summit. We were lucky we could still easily climb it this time of year due to the less than normal snowfall.